Let us just be clear: I would far prefer to have read this unabridged than listen to it abridged, except that this Regency romance classic is narrated by King Thorin. So I let my standards slip a bit and chose to listen to the abridgement anyway. And you know what? There were a few points where I think I missed out, and if I noticed I was missing out I'm sure there were more points where I missed out and didn't notice. That bugs me. 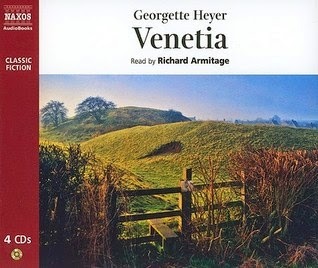 But overall this abridgement works, and the narration, though weird to get used to at first (Richard Armitage does a good job with voices, but slightly less so with Venetia's voice) works really well, and the whole story is just a lot of fun. Venetia Lanyon has led an incredibly sheltered life, by anyone's standards, for the first twenty-five years of her life. Her mother died when she was young, and her father closeted himself up and, by neglect, refused his children any emotional or practical support outside of feeding, sheltering, and clothing them. Venetia never went to London for a Season, and aside from being a bit wistful about the damage this has done to her prospects, she doesn't particularly feel the lack. Her elder brother is off in the army fighting Napoleon and her younger brother, whom she is close to, occupies himself with his studies, and Venetia manages the household, reads, walks, visits the neighbours, and generally enjoys herself. She has a couple of suitors - neither particularly suitable in her mind, but neither completely objectionable either - and some vague plans for the future, for it's fairly certain that her elder brother will eventually come home and marry, and she will be without a home. Enter Lord Damerel, who is as worldly and rascally as Venetia is sheltered and good. Damerel isn't some rake-with-a-golden-heart, either, which is a trope I don't usually mind if done well but tends to be pretty stereotyped if not. He's thoroughly debauched, with the debts and the trail of women, and he's not terribly repentant, either. But when Venetia and Damerel meet, sparks fly, and something changes for both of them when they let themselves do the unwisest of things: they become friends. There is a lot to like here, but I think what I liked best was how honest the leading couple is with each other. Damerel doesn't pretend to be something he's not (virtuous or wounded/damaged, being the two tropes that come to mind) and Venetia is pretty clear with him - and herself - as to her feelings and expectations on that front (she's mostly quite entertained by his stories). She might be sheltered but she's not stupid. And I loved that while everyone else is concerned about her reputation - that all-important currency for a woman in the period Heyer is writing about - Venetia really doesn't give a fig, as long as she gets what she wants. What she wants is Damerel. This particular character point, the carelessness of her own reputation and her willingness to court scandal, is supported by her sheltered upbringing and the fact that she's practically on the shelf without any serious prospects that she can stomach, not to mention that everyone in her life has worked very hard to keep her ignorant of some rather important bits of information. One can't really blame her for happily scheming to thwart all of them, especially since she's not thwarting them out of some sort of revenge or malicious impulse. It's just that their good opinion of her ceases to really matter. What this comes out to is a light, highly entertaining Regency romance where the characters are all very believable (even the awful ones are believably awful) and the motives and means don't seem to be imposed from a different time, which is an achievement given how strong-willed and carefree Venetia is. The plot isn't terribly exciting or ground-shaking but it's solid and has enough turns to keep one's attention. The dialogue is funny, Venetia is fantastic, and the audio abridgement might have left me feeling like things were a tad rushed but overall still worked out really well. I think this was a great introduction to the Heyer canon for me and I'm absolutely looking forward to the next. Heyer is always fun. She's one of my go-to authors when I'm tired, can't think of anything else to read, or am simply in the mood for a light-hearted read about independent heroines in great dresses working their way through a restrictive society--generally quite cheerfully. This is the thing, Venetia is so happy! I mean, not entirely, but she's optimistic and generally her outlook is positive. I really, really enjoy reading that; it's so pleasant! Hooray! I agree with you - I love the honesty of the leading couple. And just how nice Venetia is, even though she has so many sucky people in her life. Glad you read a Heyer! It's amazing that she's so positive and kind when she's surrounded by some of those people. Honestly. One wonders how she managed to stay as nice as she did.